We are a classical style, private boutique studio offering premier Pilates training. 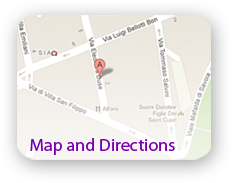 We are located near Piazza delle Muse in the Parioli neighborhood of Rome, Italy. Our instructors are dedicated to helping our clients achieve their ideal body, top personal fitness, and an increased quality of life. You’re personally invited to call us today and make a personal appointment to experience authentic Pilates instruction at its best. Community and client centered, our colorful studio is open to people of all ages, shapes and genders interested in learning the classical system and promoting Pilates culture and lifestyle. We offer instruction in Italian, and in English for the international community. We are certain that you will enjoy private Pilates sessions and value investing in your optimum body, health, and wellbeing.